A lot of people dismiss tofu because of its texture, its appearance, etc. Tofu is actually a great source of protein which makes it a great meat replacement. By definition Tofu, also known as bean curd, is a food made by coagulating soy milk and then pressing the resulting curds into soft white blocks. It is a component in East Asian and Southeast Asian cuisines. (Source: Wikipedia) Tofu can be purchased as silken, firm, or extra firm. I use extra firm because I mostly fry it to acheive the crispy texture. The key to frying the tofu is allowing it to dry for hours before preparing it. Tofu comes packaged in water. You must drain the water and allow it to sit and drain first. I then slice and coat with cornstarch or flour. Usually after I fry I let sit and then add a sauce and veggies and sauté. That is exactly what I did tonight and my family enjoyed it. Currently I have a 10 month old so quick fixes are a must. 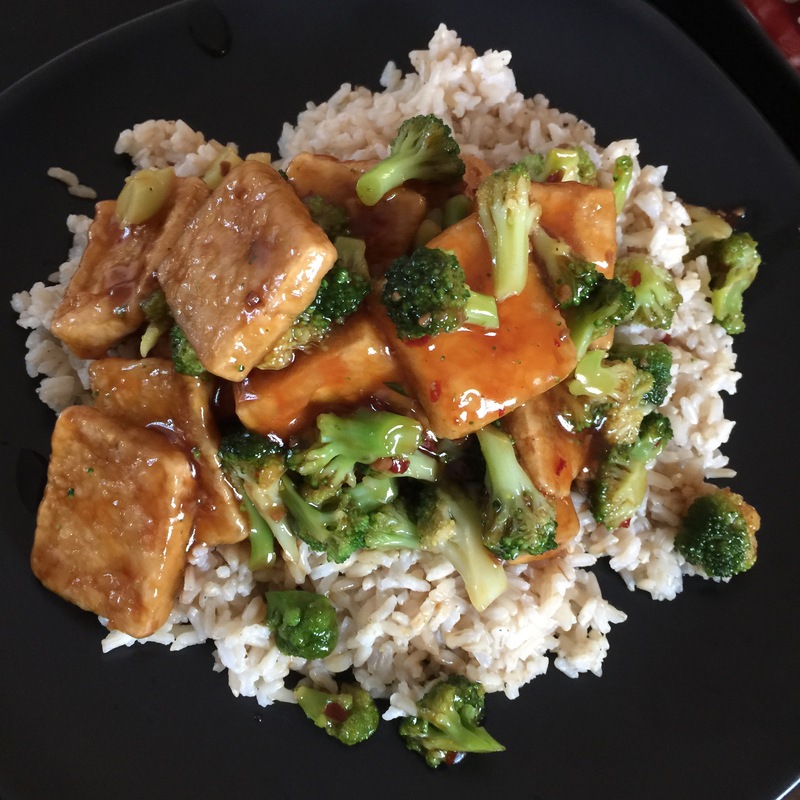 I bought pre-made general Tso sauce and simply coated the tofu and broccoli, let it blend and simmer together, and then portioned it over a bed of brown rice. Previous Post Hail to the Kale! That looks absolutely delicious! I have to try this ASAP!